Authorities in East Java have declared a state of emergency [“an extraordinary situation (KLB) status”] due to an outbreak of dengue fever, which has sickened at least 1,054 people, killing 25 across 38 regencies and cities, said a report. The state of emergency covers 11 regions in the province including the regencies of Jombang, Banyuwangi, Probolinggo, Kediri, Sumenep, Pamekasan, Nganjuk, Trenggalek, Mojokerto and Madiun as well as Madiun city, said the report. “Data from the provincial administration show that most cases of dengue fever in the province were recorded in January or December. Of the more than 26,000 cases of dengue fever in 2010, for example, some 5,500 occurred in January,” the report said. East Java, Indonesia’s second most populated province [pop: ~ 40million,] is located on eastern part of island of Java, covering an area of 47,800 km², which is administratively divided into 29 regencies and 9 cities. The incidences of dengue fever infection continue growing globally, especially since 2009, putting at least half of the world’s population at risk. “In the past few years, there has been a very significant increase of dengue fever infection in tropical areas such as Asia, Africa, and Latin America, including Brazil, which constitutes a tremendous public health challenge. It is estimated that 2 to 5 billion people are under risk of acquiring the infection worldwide, with 50 to 100 million infections reported annually, and approximately 500,000 hospital admissions. 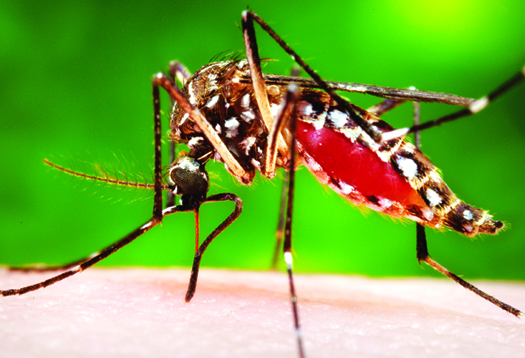 Death numbers associated with dengue are difficult to estimate,” said a report. Aedes aegypti, aka the yellow fever mosquito, is a vector for transmitting several tropical disease viruses including dengue fever, Chikungunya (CHIKV) and yellow fever. This 2006 photograph depicts a female Aedes aegypti mosquito as she acquires a blood meal from her human host, the biomedical photographer, James Gathany, at the Centers for Disease Control. Dengue fever is caused by four virus strains spread by the mosquito Aedes aegypti. (Photo Credit: James Gathany/University of Notre Dame). A mysterious new illness has killed dozens of children in Cambodia, the World Health Organization (WHO) reported. The symptoms start with high fever, followed by encephalitis, a swelling of the brain, leading to failure of the lungs and death. It takes 24 hours or less from the onset of symptoms to death. The victims were all under 7. Cases have been reported in 14 Cambodian provinces. The disease apparently has a death rate of greater than 98 percent. A Global Health Alert issued by WHO is posted below. The majority of cases were from the southern part of the country, and the victims were hospitalized in Kantha Bopha children’s hospitals in the capital Phnom Penh and Siem Reap, according to reports. 4 July 2012 – The Ministry of Health of the Kingdom of Cambodia has notified WHO of an outbreak of an undiagnosed illness which has affected 62 children, of which 61 have died since April 2012. The majority of cases were from the southern part of the country, and were hospitalised in a children’s hospital in Phnom Penh. The symptoms observed are high fever, followed by respiratory and/or neurologic symptoms with rapid deterioration of respiratory functions. WHO is working with the Ministry and other partners to investigate the outbreak, to identify the cause and source of the illness. Assistance is being provided in the area of field epidemiology and active case finding.